Harry George Walter Drinkwater (usually known in his profession as an architect as H. G. W. Drinkwater) was born in Warwick on 17 March 1844 and baptised at St Mary's Church there on 2 June. He was the son of George Drinkwater, a coachman who later became a publican, and his wife Eliza. For more details on his family, including his siblings, see the separate grave in St Sepulchre's Cemetery where his father, mother, and one of his sisters are buried. In 1851 young Harry (7) was still with his parents in Warwick, where his father was working as a coachman. By the time of the 1861 census Harry's parents were running the George Inn or Hotel at 33 Cornmarket. This stood on the corner of George Street (and was later replaced by the current bank building). The flagon on the right bears the name of Harry's father and the hotel. From 1860 to 1865 Harry was a pupil of the architect William C. C. Bramwell in Oxford, and in 1861 when he was aged 17 he was described as an assistant clerk to an architect and still living with his parents at the inn. Harry then became an assistant to the architect George Edmund Street. He won the Royal Academy Travelling Prize, and at the time of the 1871 census, when he was 27, he was lodging at 25 Abbey Place, Marylebone. In the 1870s Harry Drinkwater started up an independent practice as an architect in Oxford. In 1878, just before his marriage, he was living in Ss Philip & James’s parish (probably at 1 Farndon Road). He must then have been starting on his designs for Morrell’s Lion Brewery. Rose Carr was born in Marylebone on 30 September 1854, the youngest daughter of Charles Carr (born in Paddington in 1809/10) and his wife Rachel (born in Marylebone in 1812/13). At the time of the 1861 census her father was a tailor employing 17 men and two boys, and he and his wife were living at 46 Edgware Road with their children Matilda (24), Alfred (21), William (19), Frank (17), Clara (16), and Rose herself (6). In 1871 their address was given as 108 Edgeware Road, and Rose (17) was still living at home with her parents and two of her siblings, Emily (23) and George (21). At the time of her marriage, Rose was living at 70 Hamilton Terrace, Marylebone. Ruth Cecilia Drinkwater (born at 1 Farndon Road on 14 February 1883 and baptised at Ss Philip & James’s Church on 8 April). A new boys’ school has been built in Leckford-road for the district of St. Philip and St. James by Mr. Brucker, from designs prepared by Mr. Drinkwater. It is 36 feet by 20 feet, and there are also a class-room 18 feet by 15 feet, lavatories, &c. It is constructed of red brick, and the roof is covered with Broseley tiles. At the time of the 1881 census the architect Harry Drinkwater (37) was living at 1 Farndon Road with his wife Rose (26) and their first two children Grace (1) and George (eight months). They employed a nurse and a domestic servant. In October that year he was appointed Junior Deacon of the Alfred Lodge of Freemasons. In about 1883 Drinkwater designed Ss Philip & James’s School, and St Margaret’s Church (shown below). 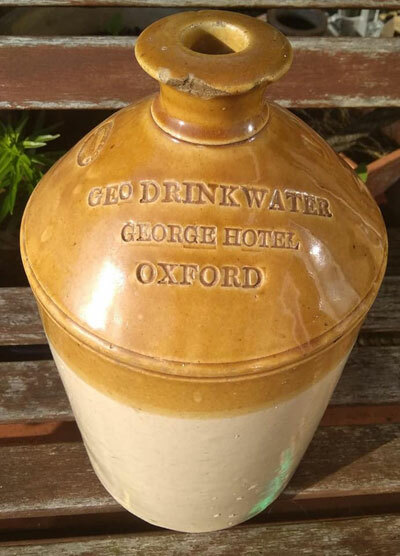 Harry Drinkwater’s brother Albert was involved with Oxford’s theatre, and In 1885 Harry bought shares in the Oxford Theatre Company Ltd; he also designed the theatre’s new building, which opened in 1886 (replaced again in 1933). Also in 1885 he designed Ss Philip & James’s vicarage at 68 Woodstock Road (now part of St Antony’s College). In 1888 Harry Drinkwater was appointed the Vicar’s Warden at Ss Philip & James’s Church, and in that year he designed the new transepts of St Frideswide’s Church and the Hall’s Brewery storehouse at 30 Pembroke Street (now the Museum of Modern Art). In 1890 he designed Nos. 59-61 Cornmarket Street for the Metropolitan & Birmingham Bank. By the time of the 1891 census, Harry’s widowed mother Eliza Drinkwater (78) had come to live with them, and they employed a governess, cook, and housemaid. Grace (11) and George (10) were at home, but their third child Ruth (8) was paying a visit to her uncle Samuel Bird, a wine merchant in Marylebone, and his wife Emily. In about 1892 Harry Drinkwater designed W. F. Lucas’s clothing factory in George Street (No. 59) and the Cape of Good Hope pub at the Plain; in about 1893 the New Lodge at the University Parks (on the eastern side of the South Parks Road gate), the new Anchor pub in Polstead Road, and Elliston & Cavell; and in 1894 the Grapes in George Street. † Harry George Walter Drinkwater died at Wokingham, Berkshire at the age of 51 on 13 October 1895 and was buried at St Sepulchre’s Cemetery on 16 October (burial recorded in the parish register of St Michael’s Church). The subject of this notice, Mr. Harry G. W. Drinkwater, architect, of 1, Farndon-road, died on Sunday morning last at Wokingham, where he had gone for a short time, hoping that the change would improve his health, which for some time past had occasioned his friends great anxiety. He was the son of the late Mr. George Drinkwater, of this city, and was born about 1843, and was articled to Mr. Street, the well-known architect, and distinguished himself by winning the travelling prize of the Royal Society of Architects. 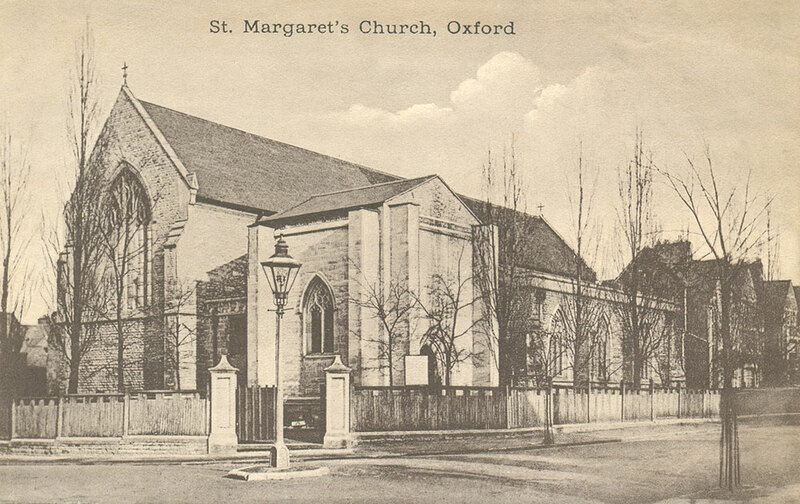 Many buildings in Oxford and the neighbourhood were designed by the deceased, including St. Margaret’s Church, the New Theatre, the Birmingham Bank in Corn Market-street [Nos. 59–61], Messrs. Lucas’s factory in George-street, and Messrs Elliston and Cavell’s business premises in Magdalen-street [later Debenham's]. During the illness of Mr Bruton the diocesan work was entrusted to Mr Drinkwater. He was one of the founders with Councillor T. Lucas of the New Theatre, of which company he was secretary. The deceased belonged to the Alfred Lodge (340) of Freemasons, of which he was an active member: he was W.M. in 1885, P.G.S.W. 1885, P.Z. Royal Arch Chapter, W.M. Royal Mark Master Masons, and P.C. Knight’s Templar. He was churchwarden of Ss. Philip and James’, and held other offices of an honorary nature. He married Miss Carr, of London, and the widow, one son, and two daughters survive him. The funeral took place on Wednesday last, at St. Sepulchre’s Cemetery, Walton-street. The coffin was borne from the deceased’s residence to SS Philip and James’ Church for the Communion Service at nine o’clock, and the interment was at twelve, the chief mourners being the widow and family, a large number of the Masonic body, and the directors of the Theatre Company, and the employés at the Theatre also attended to pay a last mark of respect. The officiating clergy were the Revs. E. C. Dermer and F. J. Brown, and the grave was a newly-constructed one near the chapel. A large number of wreaths and other floral tributes were sent by the following:— Mrs. Drinkwater and family; Miss Drinkwater; Mr. A. E. Drinkwater and family; Rev. George Champion and Mrs. T. Champion; Mr. and Mrs Bird; Mrs. Hallett and Mrs. Catliff; Mr. and Mrs. Wells; Mrs. Annie Carr; Mr. and Mrs. Timpson; Miss M. Chiveriel; the “Brethren” of the Alfred Lodge; the “Brethren” of the Bertie Lodge; the teachers and children of SS. Philip & James’ School; the manager and clerks of the Lion Brewery; Mr. Lucas, the employés of the New Theatre; the Rev. and Mrs. Robert Hartley, St. Paul’s Rectory, Wokingham; Mr. Clowes, Mr. Hutchinson, and Mr Buzand [Bayzand? ]; Dr. and Mrs. Edward Rice; Mr. and Mrs. R. Sydenham Rowell; Mr. and Mrs. James Mallam; Mr. and Mrs. James Wicks; Mrs. Jorden and Miss Hunt; Mr. Walter Sotham; Mr. and Mrs Robert Sotham; Mrs. Pinfold and Miss Lee; Mr. Llewellin; Mr. and Mrs. Herbert Hurst; Dr. and Mrs. Whitmarsh; Miss Swann; Mrs. G. J. Digues La Touche; Mrs. Collcutt; Nurse Penson; Mrs Handy. Messrs Elliston and Cavell carried out the arrangements of the funeral. Mrs. Drinkwater and Family desire to express their sincere gratitude for kindness and sympathy received during their bereavement. His daughter Ruth Cecilia Drinkwater married Reginald Michael Roberts in Paddington in the third quarter of 1909. † Mrs Rose Drinkwater née Carr died at 67A St Giles’s Street at the age of 71 on 13 April 1926 and was buried at St Sepulchre’s Cemetery on 15 April (burial recorded in the parish register of St Michael’s Church). Her effects came to £3,334 4s. 6d. George Drinkwater, who had been educated at the Dragon School and Rugby, went up to Wadham College in 1897, and rowed in the 1902 and 1903 Boat Race. He fought in the Boer War and First World War, and was awarded the Military Cross. He was an architect and portrait painter, and also the rowing correspondent for the Daily Telegraph. In 1914 he married the singer Carmen Hill: they lived at 8 Warwick Avenue, London and had one son, John. 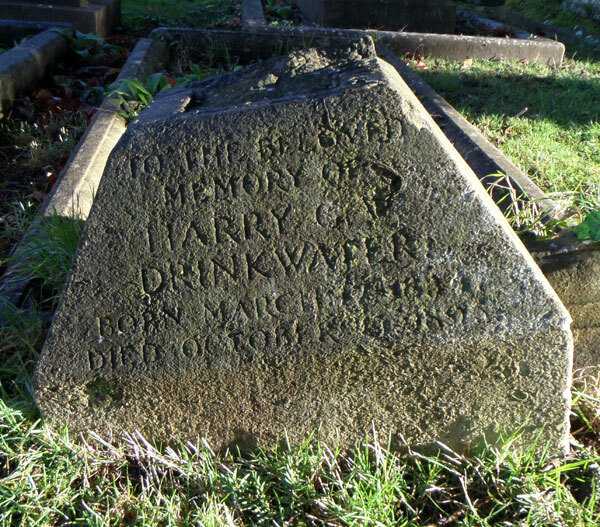 † George Carr Drinkwater died at St Mary’s Hospital, Paddington at the age of 60 on 12 May 1941 and was buried at St Sepulchre’s Cemetery on 15 May (burial recorded in the parish register of St Michael’s Church). Mr George Carr Drinkwater, R.B.A., who has lost his life through enemy action at the age of 60, was an architect and artist by profession, but was better known as a rowing coach and a writer on rowing. The son of H. G. W. Drinkwater and a cousin of the late John Drinkwater, he was educated at Rugby and Wadham College, Oxford, and rowed in the Oxford crews of 1902 and 1903. He served as a trooper in South Africa in 1900, and in the last War rose to the rank of Brigadier-Mahor, R.A., winning the M.C. and being twice mentioned in dispatches. For nearly 35 years he had been the rowing correspondent of the Daily Telegraph, and he was the author of several books on the history of the University boat race. As an architect, he was responsible for new buildings and alterations both at Oxford an Cambridge. He married Carmen Hill, the singer, and there was one son of the marriage. His widow Carmen died at Hampstead near the beginning of 1952. † Miss Grace Drinkwater died at 17 Plantation Road, Oxford at the age of 80 on 22 March 1960 (relevant St Michael burial register not transcribed). Her effects came to £1,798 8s. 1d. Ruth Cecilia Drinkwater, Mrs Roberts (born 1883) was living in 1911 at the Old Manor, Ivinghoe with her husband Reginald Michael Roberts (29), who was a brewer born in Ivinghoe, and their only son Richard Anthony Mann Roberts (four months), plus two servants. Her husband served in the First World War and rose to be a Captain in the Royal Army Service Corps. Ruth died at the Old Manor House on 28 October 1953. Her effects came to £1,103 9s. 4d., and probate was granted to her husband, now a company director.